Green and pink are one of my favorite color combos, from the brightest shades to the subtlest. Combining these two colors with a fun brioche motif resulted in a look that reminded me of a forest with lollipops in pink. Inspired by bubble motifs that resemble lollipops, these socks are like Candyland and fairy tales for grownups! Choose two colors that either really ‘pop’ for ultimate wow-factor, or a color combo that appears more muted for a more mature look. These socks are meant to be more slipper-socks than boot socks; worked in a sport-weight yarn, they yield a squishier sock that’s perfect for wearing around the house. Since they’re worked in brioche, I wouldn’t suggest planning a project that’s going to get lots of wear. Make these as a treat for your feet! 1-1.5” 2-2.5 cm negative ease recommended. Thanks, Space Cadet Yarn, for providing the yarn for Lollipop Forest! Space Cadet has curated some lovely kits with spectacular color combos for these socks. Check them out here! 26 sts and 36 Rounds = 4” 10 cm in St st worked in the rnd after wet blocking. 22 sts and 64 Rounds = 4” 10 cm in brioche rib worked in the rnd after wet blocking. This pattern is worked toe-up with Magic Loop. You are welcome to substitute another favorite method of knitting socks (ie: two long circulars, dpns, etc); however, please note that the heel shaping is most easily worked on one circular. The instructions are most easily followed this way. The cast on for this project is Judy’s Magic Cast On, but you are also welcome to change this to any other cast on for toe-up socks as you desire. 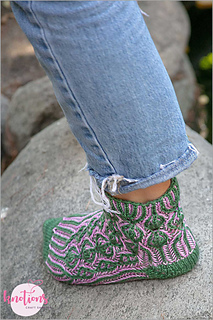 The foot and cuff of this sock feature brioche rib in two colors, worked entirely in the round. For best results, be sure to bring your yarn to the front of your work and let it hang after every round. This will ensure that your round transitions will be entirely invisible.